Mac Download Instructions in Word and PDF format. Step 1: BARD downloads: Log in to https://nlsbard.loc.gov with your NLS username and password. WTBBL local downloads: Log in to http://www.wtbbl.org/login.aspx with your WTBBL account ID and password. Step 3: Once you arrive at your chosen book, find the blue underlined link associated with that book. The link will be below the book's summary. Click the link or press Enter to begin the download (Figure 2). Step 4: Safari will automatically download the title into a "Downloads" folder on your hard drive (Figure 3). Step 5: After the download is complete, go to the "Downloads" folder. This will be either on your Dock or in Finder's User section (Figure 4). Step 6: Make sure your flash drive is plugged into a USB port on your computer. Step 7: Either Drag or Copy and Paste the downloaded book folder into your flash drive. You can now repeat the same download and move to flash drive process for other book or magazine titles. Step 8: After you have completed downloading and moving all of your books, close all open windows. Step 9: Eject your flash drive. Step 10: To play the books: insert your flash drive into the USB port on the right side of the DTBM. 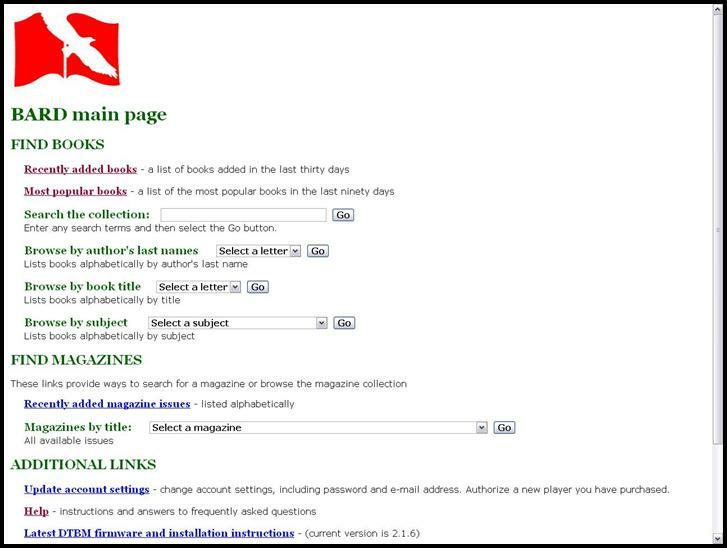 To browse through the books on your flash drive you will use the Bookshelf mode. To open the Bookshelf press and hold the Green (Square) Play/Stop button for 5 seconds to access the bookshelf. You will hear a beep and a voice announce “Bookshelf” and the number of books on the flash drive. Use the RW and FW keys to locate the book you want to read. To go from Book 5 back to Book 1, use the RW button. Push the Play/Stop key again to begin playing the book.